Tamilnet accessible once more from Sri Lanka? As suddenly and mysteriously as it was taken off, Tamilnet.com is accessible once more from my SLT ADSL connection this evening. Perhaps the boffins at the MoD forgot to send their weekly memo to ISPs asking them to block the site? Tamilnet has been inaccesible over any wired or wireless Internet connection from all ISPs in Sri Lanka since June 2007, though it briefly came back online in December 2007. Computers will crash. The cloud, which runs on computers, will crash. Once you realise this, planning for when the cloud does go down becomes just another way of ensuring business continuity. I’ve covered this in a post I wrote when WordPress.com went down. Bearing witness to the atrocities, brutality and embedded humanity in war is difficult. Embedded journalism is fraught with challenges and even projects like Kevin Sites in the Hot Zone faced problems of continued support for sustained coverage. In this context comes a compelling website from Reuters, documenting 5 years of a tragic war in Iraq. Bearing Witness: Five Years of the Iraq War documents in through an interactive timeline, maps and other multimedia, facets of war and life in Iraq after the US led invasion of the country in March 2003. There are some disturbing, viscerally compelling images here by Goran Tomasevic. There is, and never can be, any single source or definitive account of a war. Efforts such as this however, through captivating visuals and an interactive narrative, pull in viewers to critically look at a brutal, useless war that we have long since normalised. Closer to home, and we will never find photographic evidence of this nature on our own on-going war. More accurately, photos taken for propaganda exclude more than they seek to explore or highlight. There is a qualitative difference between Goran’s photos and those on TRO’s Flickr stream, the Sri Lankan Army website or those featured in any number of Sinhala and Tamil diaspora sites that exclusively feature the brutality of the ‘other’, but never the consequences of one’s own violence. It’s the first time I’ve written on theatre on this blog, and with good reason. Censored, a forum theatre production by Beyond Borders in association with the British Council, will take to the stage on the 20th of this month. Watch it. Participate in it. Censorship has been with us ever since the production of knowledge, and it certainly won’t go away. The internet and web were supposed to emancipate us from shackles of parochialism and ignorance, and to an extent have. However, governments, non-state actors and today, even Internet Service Providers, constantly find new ways and new reasons to curtail and block information flows. From burning ‘satanic Harry Potter‘ books, to the Catholic Church’s Index Librorum Prohibitorum, from the Licensing of the Press Act of 1662 in England to more recent moves in Sri Lanka to censor information on the internet and mobiles, polity and society everywhere has grappled with the free production of information and the maintenance of public order, national security, morals et al. In May and June 1958, in Ceylon, occurred what were up till then the most serious communal riots in Sri Lanka’s troubled history of ethnic relations. In retrospect, the events of 1958 were mere portents of the horrors that were to come. A contemporaneous journalistic account of what happened was written by Tarzie Vittachi, editor of Asia’s oldest newspaper, the Ceylon Observer, satirical columnist, and intrepid political commentator. In the context of the blanket censorship imposed under Sri Lanka’s first post-independence experience of emergency rule, the manuscript was published in London under the title Emergency ’58 by Andre Deutsch, in what has now become a classic of Sri Lankan political literature. The book was banned in Ceylon, and Tarzie Vittachi subsequently left the country, under the cloud of death threats. The issue of censorship recently came to a head with the Private Television Broadcasting Station Regulations introduced by the Rajapakse regime. Overbroad, ill defined and outrageously conflating technical standards and concepts such as IP TV with video over the internet, with no definition of broadcast and with for reason other than to clamp down on dissent and criticism of the Rajapakse regime, journalist Namini Wijedasa was spot on when she said that the regulations placed media at the mercy of idiot ministers. The regulations have a particularly sinister bent, in that they can be used by the regime as well as by ISPs (fearful of losing their broadcast license) to censor video over the internet, which affects all bloggers in Sri Lanka whether they produce video content themselves or wish to consume content on sites such as YouTube. The freedom of expression is by no means an absolute right. One finds in European and American jurisprudence, particularly with regard to the interpretation of Article 10 of the European Convention on Human Rights by the European Court of Human Rights and the First Amendment of the American Constitution by the US Supreme Court respectively, a healthy debate on the freedom of the press and the freedom of expression. My own interest in the issue comes from the perspective of communicative rights, that all peoples have a right to access and participate in the creation of a wide and diverse range of information and views. If I have a gripe, it is that the performance is only slated for a single night. Given the monumental challenges facing the freedom of expression in Sri Lanka, I encourage the producers to consider staging Censored again, and importantly, staging it out of Colombo and the Western Province. 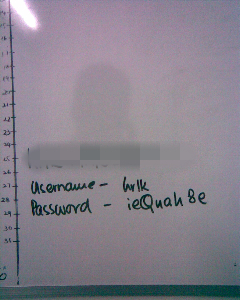 Last week I captured through my mobile phone camera the user account, password and URL of a confidential human rights monitoring and advocacy database. The users had plastered these details on a public notice board for easy reference, in a manner that could be viewed by anyone who came into the office. It hadn’t occurred to them that this wasn’t entirely the best thing to do. These are computer literate, committed and experienced human rights activists, who have no interest whatsoever in jeopardizing the information in the database and are acutely aware of the consequences of information in the database falling into the wrong hands. Yet, this sort of practice is common – in another Sri Lankan human rights advocacy organisation, users had actually posted up access details on Post-It notes that were stuck to the monitor! InfoShare’s significant experience in the design and deployment of highly secure ICT solutions for peacebuilding / human rights protection suggests that network intrusions and data leaks are often the result of the monumental carelessness and oversight of end users rather than any sophisticating remote hacking by a third party. Sustained user education on security is vital and the design of information systems with multiple safeguards against this sort of bad practice. As I told the colleague responsible for this particular oversight, good IT security hopes for commonsense but plans for the risk of disappointment. Lankapuvath, Sri Lanka’s state owned news agency, launched a new website recently. Doesn’t look half-bad, though they don’t seem to have heard of RSS feeds. Lankapuvath is the Sri Lanka’s National News Agency and only news agency in the country. The only news agency in the country?! Ancient rulers of Sri Lanka built monuments established institutions to honor the philosophy of Buddhism. In turn this led to lesser folks following the principles advocated by Buddhism en masse. Given that the whole post, ostensibly dealing with Sri Lanka’s culture and heritage, has no mention of any other identity aside from Sinhalese Buddhists, it’s not hard to guess who the lesser folks were. The Lankapuvath website has been updated and the link to the story above is no longer valid. Managed to pull a copy of the old page through Google Cache. It’s here online (though I don’t know how long Google Cache maintains archives) and here as a PDF. Interview with Dan Gillmor at GKP GK III in Kuala Lumpur, Malaysia, 13th December 2007. I moderated a panel titled Pushing the envelop: New Media, Citizens Journalism, Human Rights and Development that had Dan on it at the Global Knowledge Partnership, GK III conference. Clip 1 – What is Citizen Journalism? Clip 2 – How did you become involved in Citizen Journalism? Clip 3 – Citizen Journalism seems to be a growing trend in the world. So what now is the role of the professional media? Clip 4 – What about the credibility of reports that are posted by Citizen Journalists? Clip 5 – What is the future for Citizen Journalism?